The Enemy of Hypocrisy, The Friend of Frankness. 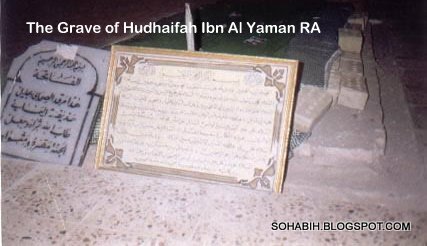 Hudhaifa Ibn al-Yaman RA was one of the early converts to Islam and shared a very close relationship with Rasulullah SAW. His father al-Yaman was from Makkah, but had to flee to Medina as he had killed someone in Makkah. Though the ban for him to enter Makkah was lifted after some time, he chose to make Medina his place of residence and hence Hudhaifa Ibn al-Yaman RA, despite being a Makkan, had his upbringing in Medina. With these words, Rasulullah SAW, addressed Hudhaifa Ibn al-Yaman RA when he met him for the first time in Makkah. How did Hudhaifa Ibn al-Yaman RA come to have this choice'? "If you wish you may consider yourself among the Muhajirin, or if you wish you may consider yourself one of the Ansar. Choose whichever is dearer to you," replied Rasulullah SAW. "Well, I am an Ansari. O Rasulullah," decided Hudhaifa Ibn al-Yaman RA. His father, al-Yaman was a Makkan from the tribe of Abs. He had killed someone and had been forced to leave Makkah. He had settled down in Madinah, becoming an ally (halif) of the Banu al-Ash-hal and marrying into the tribe. A son named Hudhaifa Ibn al-Yaman RA was born to him. The restrictions on his returning to Makkah were eventually lifted and he divided his time between Makkah and Madinah but stayed more in Madinah and was more attached to it. This was how Hudhaifa Ibn al-Yaman RA had a Makkan origin but a Madinah upbringing. When the rays of Islam began to radiate over the Arabian Peninsula, a delegation from the Abs tribe, which included al-Yaman, went to Rasulullah SAW and announced their acceptance of Islam. That was before Rasulullah SAW migrated to Madinah. Hudhaifa Ibn al-Yaman RA grew up in a Muslim household and was taught by both his mother and father who were among the first persons from Madinah to enter the religion of Allah SWT. He therefore became a Muslim before meeting Rasulullah SAW. Hudhaifa Ibn al-Yaman RA longed to meet Rasulullah SAW. From an early age, he was keen on following whatever news there was about him. The more he heard, the more his affection for Rasulullah SAW grew and the more he longed to meet him. Hudhaifa Ibn al-Yaman RA eventually journeyed to Makkah, met Rasulullah SAW and put the question to him, "Am I a Muhajir or am I am Ansari, O Rasulullah?" Hudhaifa Ibn al-Yaman RA appointed to be the governor of Mada’in. The people of Mada’in came out in great numbers to welcome their new governor chosen by their Caliph Umar (May Allah be pleased with him). They came out preceded by their interest in that graceful Companion. They had heard much about his good conduct, his piety, and more so about his great achievement in the conquest of Iraq. While they were waiting for the coming procession, they saw before them a bright fellow riding on a donkey with an old saddle. The man was riding with his legs hanging and holding a loaf of bread and some salt in his hands, and eating and chewing his food. When he came in the midst of the people and they discovered he was Hudhaifa Ibn al-Yaman RA, the expected governor, they were about to lose their wits! But why the surprise? Who did they expect the choice of "Umar would be? In fact, they were not to blame. Their countries had not been accustomed since Persian days or even before to having rulers of with such graceful style. Hudhaifa Ibn al-Yaman RA was surrounded and welcomed by numerous people. When Hudhaifa Ibn al-Yaman RA saw that they were gazing at him as if expecting a speech, he looked at them closely and said, "Beware of sedition!" They asked, "What is sedition, Abu 'Abd Allah?" "The gates of rulers," he said. "When one of you is admitted to the presence of the ruler or governor. Than falsely agrees with what he says and commends him for what he has not done." It was a wonderful start, as much as it was surprising. People at once remembered what they had heard about their new governor and that Hudhaifa Ibn al-Yaman RA did not detest anything in the whole world as much as he detested and scorned hypocrisy. Such a beginning was the truest expression concerning the character of new governor and his way of ruling and governing. As a matter of fact, Hudhaifa Ibn al-Yaman RA was a man who came to life equipped with a unique characteristic in detesting hypocrisy and in having the remarkable capability to detect it in its distant, concealed places. Hudhaifa Ibn al-Yaman RA and his brother Safwan Ibn al-Yaman RA came to the Rasulullah SAW accompanied by their father and all embraced Islam. Hudhaifa Ibn al-Yaman RA added more sharpness and polish to his inborn qualities from the time he embraced a powerful, clean, brave, and straightforward religion which scorns cowardice, hypocrisy, and lies. Moreover, Hudhaifa Ibn al-Yaman RA learned his manners at the hands of Rasulullah SAW who was as clear as the glorious morning light. Nothing was hidden in his life or in his inner self. He was truthful and trustworthy. 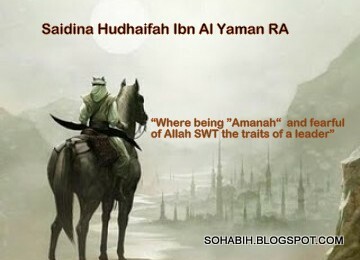 Hudhaifa Ibn al-Yaman RA liked the strong in righteousness and detested those who were not straightforward, i.e. the hypocrites and deceivers. Therefore, there was no realm where his talent could bloom and blossom more than it did under the guidance of faith at the hands of Rasulullah SAW and among that generation of his great Companions. Verily, Hudhaifa Ibn al-Yaman RA talent grew and developed, and he specialized in reading faces and probing into the inner selves. At a glance he could easily read faces and know the secret of the hidden depths and concealed inner mysteries. 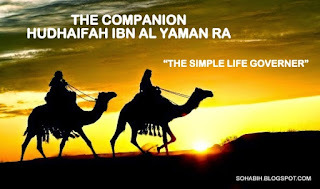 He attained what he wanted in that realm to the extent that the inspired, intelligent, and resourceful Caliph Umar Al Khattab RA used to ask Hudhaifa Ibn al-Yaman RA 's opinion and insight in selecting and knowing men. Hudhaifa Ibn al-Yaman RA possessed the discretion that made him realizes that what is good in this world is obvious to whoever seeks it and that evil is the thing that is disguised and hidden. Therefore, the intelligent person should be discreet in studying evil in its hidden and apparent forms. Hudhaifa Ibn al-Yaman RA therefore devoted his time to the study of evil and evil doers, as well as hypocrisy and hypocrites. Hudhaifa Ibn al-Yaman RA reported: People used to ask Allah's Rasulullah SAW about good, but I used to ask him about evil, for fear that it should overtake me. I said, "0 Rasulullah!, we were in ignorant and evil times, then Allah SWT presented us with this good. Will there be evil after this good?" He said, "Yes." Hudhaifa Ibn al-Yaman RA said, "And after this evil, will there be good?" He said, "Yes but it would be tainted with evil (literally, smoke)." I asked, "What will this evil be?" He said, "There will be some people who will lead (people) according to principles other than my tradition. You will see their actions and disapprove of them." I said, "Will there be any evil after that good?" He said, "Yes, there will be some people who will invite others to the doors of Hell, and whoever accepts their invitation to it will be thrown in it (by them)." Hudhaifa Ibn al-Yaman RA said, "0 Messenger of Allah! Describe those people to us." He said, "They will belong to us and speak our language." Hudhaifa Ibn al-Yaman RA asked, "What do you order me to do if such a thing should take place in my life?" He said, "Adhere to the group of Muslims and their chief." Hudhaifa Ibn al-Yaman RA asked further, "If there is neither a group (of Muslims) nor a chief, what shall I do?" He said, "Keep away from all those different sects, even if you have to eat the roots of a tree, till you meet Allah SWT while you are still in that state." Note Hudhaifa Ibn al-Yaman RA statement, "People used to ask Rasulullah SAW about good, but I used to ask Rasulullah SAW about evil, for fear that it should overtake me." Hudhaifa Ibn al-Yaman RA lived open- eyed and insightful with regards to temptations and the paths of evil so that he might avoid them and warn people of them. This gave him insight of the world, experience with people, and knowledge of the times. He would contemplate matters in his mind as a philosopher would and with the sound judgment of a wise man. Hudhaifa Ibn al-Yaman RA said (May Allah be pleased with him): "Almighty Allah sent Rasulullah SAW to call people from misguidance to the right path, and from disbelief to belief in Allah. Some responded to his call, following the right way. Those who were dead were raised to life and those who were alive died because of their evil doing. When the period of Prophethood was over, caliphates followed the same methods. Then there appeared a detested monarchy. There were people who disavowed with their hearts, hands, and tongues, and who responded to the path of justice. There were those who disavowed with their hearts and tongues but abstained from using their hands. Thus they left out an area of justice. There were also those who disavowed with their hearts, abstaining to use their hands or tongues. Thus they left out two areas of justice. There were those who did disavow, neither with their hearts, nor with their hands or tongues, and those were the dead in life! Hudhaifa Ibn al-Yaman RA talked about hearts and a life of guidance or misguidance according to the heart. Hudhaifa Ibn al-Yaman RA He said: There are four kinds of hearts: a locked heart, which is the heart of the disbeliever; a duplicitous heart, which is the heart of the hypocrite; a pure heart full of light, which is the heart of the believer; and a heart filled with hypocrisy and faith. Its faith is like a tree supplied with good water, but like hypocrisy because it is like an ulcer filled with pus and blood. Whichever is made will win. “ I approached Rasulullah SAW and said, "0 Messenger of Allah, I have an abusing tongue towards my people, and I am afraid it might lead me to the fire of Hell." Rasulullah SAW said to me, "Do you ask Allah's forgiveness? I repent to Allah a hundred times a day." That was Hudhaifa Ibn al-Yaman RA, the enemy of hypocrisy and the friend of frankness. For a man of this character, his faith had to be strong and his loyalty intense. That was Hudhaifa Ibn al-Yaman RA’s way, in respect to faith and loyalty. Hudhaifa Ibn al-Yaman RA witnessed his father die as a Muslim in the battle of Uhud, killed in error by Muslim hands, mistaking him for one of the unbelievers. Hudhaifa Ibn al-Yaman RA was looking around when by chance Hudhaifa Ibn al-Yaman RA saw the swords hitting him, so he called to his attackers, "My father! My father! He's my father,'" But it was too late. When the Muslims heard about this incident they were grieved, but Hudhaifa Ibn al-Yaman RA looked at them with mercy and forgiveness and said, "May Allah forgive you. He is the Most Merciful." Hudhaifa Ibn al-Yaman RA then went forward with his sword towards the raging battle, doing his best and performing his duty. When the battle ended and Rasulullah SAW heard the news, he ordered that blood money be paid for the death of Hudhaifa Ibn al-Yaman RA 's father, Husail Ibn Jabir RA.Hudhaifa Ibn al-Yaman RA refused to take the money and gave it as alms to the Muslims, an act which made Rasulullah SAW) love and appreciate him even more. Hudhaifa Ibn al-Yaman RA’s faith and loyalty refused to acknowledge inability and weakness, or even the impossible. In the Battle of Al-Khandaq and after the failure of the unbelievers of the Quraish and their Jewish allies, Rasulullah SAW wanted to know the latest developments in the enemy camp. The night was black and terrifying, and a storm was raging as if it wanted to uproot the solid mountains of the desert. The whole situation - which included a siege, stubbornness and perseverance - brought about fear and anxiety. In addition, hunger had reached a high level among the Companions of Rasulullah SAW. Therefore, who would have the strength to go amidst the dark dangers of the enemy camp and penetrate it to gather intelligence and news? Rasulullah SAW was the one who selected him from among his Companions as the one to perform such a difficult task. Who was that hero? It was Hudhaifa Ibn al-Yaman RA. Rasulullah SAW asked him and he obeyed. Hudhaifa Ibn al-Yaman RA admitted with great candor in relating the incident that he had no choice but to obey, thus implying that he feared the mission being assigned to him. Hudhaifa Ibn al-Yaman RA was afraid of its consequences. His fear was due to performing this mission under the pinch of hunger, cold weather, and extreme exhaustion that resulted from the siege by the disbelievers that had lasted a month or more. What happened to Hudhaifa Ibn al-Yaman RA that night was amazing? Hudhaifa Ibn al-Yaman RA covered the distance between the two armies and penetrated the surrounding enemy camp of the Quraish. A violent wind had put out the camp's fires, so the place was enveloped in darkness. Hudhaifa Ibn al-Yaman RA took his place amidst the lines of the fighters. The leader of the Quraish, Abu Sufyan, was afraid that darkness might surprise them with scouts from the Muslim camp. He stood to warn his army, and Hudhaifa Ibn al-Yaman RA heard his loud voice saying, "0 people of the Quraish, each one of you should know who is sitting next to him and should know his name." Hudhaifa Ibn al-Yaman RA reports, "I hastened to the hand of the man next to me, and said to him, 'Who are you?' He said, 'Such and such a person!'" Hudhaifa Ibn al-Yaman RAtherefore secured his being with the army in peace! Abu Sufyan resumed his talk to the army, saying, "0 people of the Quraish, by Allah, you are not in a place to settle. The horses and the camels are exhausted. The tribe of Bani Qurayzah has reneged on us and we learned about them what we hate, and we suffer from the violent wind as you see. No food can be cooked, no fire can blaze for us, and no structure can hold. You have to leave, for I am leaving." He then mounted his camel and started moving, followed by the fighters. Hudhaifa Ibn al-Yaman RA said, "But for the promise I gave Allah's Messenger (PBUH), who asked me not to do anything until I returned to him, I would have killed him with an arrow." Hudhaifa Ibn al-Yaman RA then returned to Rasulullah SAW and gave him the information. Whoever saw Hudhaifa Ibn al-Yaman RA arid considered his way of thinking, his philosophy, and his devotion to knowledge could hardly expect any heroism from him in the battlefield. Nevertheless, Hudhaifa Ibn al-Yaman RA contradicted all expectations. The man who used to worship Allah in solitude, the contemplative one, no sooner did he carry his sword and meet the ignorant pagan army than he disclosed a genius that caught the eyes. Suffice it to know that Hudhaifa Ibn al-Yaman RA was one of only three or five who had the great privilege of invading all the cities of Iraq. In Hamdan, Ar-Raiy Ad-Dainawar, the conquest was accomplished through him. In the great Battle of Nahawand, in which the Persians gathered about 150,000 fighters, Caliph 'Umar Al-Khattab RA the Commander of the Faithful, chose for the leadership of the Muslim armies An-Nu'man Ibn Muqqarin RA, then wrote to Hudhaifa Ibn al-Yaman RA to march to him leading an army from Kufa. 'Umar sent his letter to the fighters, saying, "When the Muslims gather, let every commander lead his army, and let An- Nu’man Ibn Muqqarin RA be the commander-in-chief of all the armies. If An-Nu’man RA is martyred, let Hudhaifa Ibn al-Yaman RA became the leader. If he is martyred, let Jarir Ibn 'Abd Allah RA lead them." In this way, the Commander of the Faithful went on choosing the leaders of the battle till he named seven of them. Then the two armies met. The Persians were 150,000 soldiers while the Muslims were only 30,000. A battle which exceeded all others commenced. It was the fiercest in history, in terms of violence and heroism. The leader of the Muslim army, An-Nu’man Ibn Muqqarin RA fell in the battle and was martyred, but before the standard of the Muslims fell to the ground, the new leader caught it with his right hand, and with it he led the wind of victory with vigor and great heroism. This leader was none but Hudhaifa Ibn al-Yaman RA. At once he held the standard and chose not to announce the news of the death of An-Nu^man Ibn Muqqarin RA until the battle was over. Hudhaifa Ibn al-Yaman RA called Na'im Ibn Muqqarin RA to be in the place of his brother to honor him. How Hudhaifa Ibn al-Yaman RA achieved all this in no time, in the heart of the great battle, was through his bright intuition. Then Hudhaifa Ibn al-Yaman RA turned like a violent tempest wind towards the Persian lines shouting, "Allahu Akbar! Allah is the greatest! His Promise is fulfilled! Allahu Akbar! He led His soldiers to victory!" Then Hudhaifa Ibn al-Yaman RA turned the head of his horse towards the fighters of his army and called, "O you followers of Rasulullah SAW here are Allah's Gardens ready to receive you, do not let them wait long. Come on, men of the Battle of Badr! Proceed, 0 you heroes of the Battle of Al-Khandaq, Uhud, and Tabuk!" Hudhaifa Ibn al-Yaman RA kept all the enthusiasm and interest of the battle, if not more. The fighting ended in overwhelming defeat for the Persians, an unmatched defeat! That was his genius in wisdom when he remained in his rooms and genius in fighting when Hudhaifa Ibn al-Yaman RA stood on the battlefield. Hudhaifa Ibn al-Yaman RA was also a genius in each mission assigned to him and each advice asked of him. When Sa'd Ibn Abi Waqqas RA, and the Muslims with him moved from Mada’in to Kufa and settled there after the great harm that had afflicted the Muslim Arabs due to Mandarin’s climate, Saidina Umar Al Khattab RA the caliph wrote to Sa'd to leave at once after the most suitable sites for Muslims to resettle were found. Who was deputed, to choose the site and the place? It was Hudhaifa Ibn al-Yaman RA, accompanied by Salman Ibn Ziyad RA who sought a suitable place for Muslims. When they reached the land of Kufa, it was a barren, sandy land, full of pebbles, but Hudhaifa Ibn al-Yaman RA smelled the breezes of healing and health. Hudhaifa Ibn al-Yaman RA said to his companion, "This place, Allah willing." That was how Kufa was planned, and the hands of construction turned it into an inhabited city. As soon as the Muslims emigrated there, their sick were cured, their weak became strong, and their veins were filled with the pulse of health. Hudhaifa Ibn al-Yaman RA was very intelligent and had various experiences. Hudhaifa Ibn al-Yaman RA always used to say to the Muslims, "Your best are not those who neglect this world for the last, nor those who neglect the last for this world. The best are those who take from this and that." One day in the year A.H. 36, Hudhaifa Ibn al-Yaman RA was called to meet his Lord. While he was getting ready for the last journey, some of his companions came to see him. Hudhaifa Ibn al-Yaman RA asked them, "Have you brought a shroud with you?" They said, "Yes." He said, "Show it to me." When he saw it, Hudhaifa Ibn al-Yaman RA found it was new and too long. One last sarcastic grin was drawn on his lips, and he said, "This is not a shroud for me. Two white wraps without a shirt are sufficient for me. I will not be left in the grave for a long time, but will be offered a better place or a worse one!" Hudhaifa Ibn al-Yaman RA then murmured a few words which, when they listened to them, they discerned the following: "Welcome O death! A dear thing coming after longing. The one who repents now prospers not." One of the best human souls was raised to Allah, one the most pious, illuminating, and humble spirits. From his father, that: some people referred a dispute to the Prophet (saw) about a hut, so that he could judge between them. He sent Hudhaifa to judge between them, and he ruled in favor of those who had the rope (with which the hut was blinded together). When he went back to the Prophet (saw) he told him (what he had done) and he said: "You did the right thing, and you did well." That the wives of Rasulullah SAW, All differed with Aisyah and refused to Allow anyone with ties of breastfeeding like Salim, the freed slave of Abu Hudhaifa, to enter upon them. They said: "How do we know? That may be a concession granted only to Salim." Selected lectures and videos about Hudhaifa Ibn Al Yaman RA.